*Keep in mind that while CBD for dogs has numerous health benefits, some of which have been proven scientifically, you should never administer it without the approval and guidance of your veterinarian. Overall, CBD hasn't yet gone through enough rigorous safety testing in canines and we still need more studies on this. CBD stands for Cannabidiol, a Cannabinoid. Cannabidiol is derived from cannabis plant (also known as marijuana); however, it is not the same as the psychoactive derivative we know as the chemical compound THC (Tetrahydrocannabinol). CBD is NOT a psychoactive drug; it will not get your dog high. Yes, and no. CBD and THC both are derived from the cannabis plant (marijuana). However, they are not the same thing (Atakan, 2012; Ther Adv Psychopharmacol). THC is the psychoactive compound found in cannabis that people are most familiar with. It’s what gives cannabis its effect of getting people “high”. THC generally comes from plants cultivated to produce more THC. CBD has many healing properties but comes without the “stoned” feeling that THC provides because it's not psychoactive. CBD generally comes from plants that are less cultivated than the high THC content plants. When grown, cannabis can be specifically cultivated to be high in THC so that the psychoactive effects are higher. This is “beneficial” to those looking to grow cannabis as a drug to experience the “high” effects because the more powerful the psychoactive effects of the drug, the more it can be sold for. When grown without special cultivation, however, and levels of THC are exceptionally low or non-existent, the cannabis plant is sometimes referred to as hemp and is often used for medicinal applications without the “stoned” effect. What we're discussing here is CBD hemp for dogs and its non-psychoactive applications. For more on the history of the legalities of CBD, read the High Times article. With the laws on CBD becoming more lax, and the government recognizing its huge health benefits, now it's far easier than ever to buy products of CBD for dogs, in one of the three forms: CBD oil, CBD pills or CBD dog treats. CBD can be purchased online, in local smoke shops, and from some health food stores. While other types of stores may carry CBD, it isn’t advisable to get them elsewhere since quality control and regulation of sales can be too lax. Plenty of new options are showing up every day. More companies are getting into this business as well, and now you can find anything from plain CBD oil for dogs, to CBD dog treats (review), and even a CBD gel pens (review). Whenever you purchase CBD for dogs products, ensure the company is reputable and consult with your vet first. Now that you know a little more about what CBD is, let’s take a look at some of the common uses of CBD in dogs and how the CBD hemp oil can help your pooch. All of these health benefits have been suggested and/or proven to a certain extent, and I will use studies with dogs first, followed by any other animal studies and then human trials. It's estimated that about 1-5% of dogs (PDF) will suffer from either idiopathic or symptomatic seizures. CBD can be used to reduce seizure activity in dogs with seizure disorders and epilepsy that does not respond to typical treatment (1, 2, 3). CBD is also utilized for drug-resistant seizures in humans with Dravet Syndrome where fevers are induced by fever or hot temperatures (4). Cancerous tumors can be reduced in size before surgery or killed off completely with the application of CBD for dogs. A multitude of studies have demonstrated anti-tumor effects of CBD (5, 6, 7, 8). Unfortunately, in this case, the tumor was very aggressive and began growing out of control until it impeded normal function and her dog had to be put to sleep. Had the tumor been less aggressive in its growth, however, it’s entirely possible that it would have fallen off completely as a result of using CBD oil. An article on AVMA tells a similar story about a dying dog and the use of marijuana. CBD can be used to control chronic pain resulting from illness or injury that cannot be treated with traditional methods of pain control in dogs. This has been confirmed in many human and some animal studies (9, 10, 11, 12), but there's a lack of research with canine models. In clinical trials, CBD has been shown to have a significant impact on pain caused by severe arthritis (13, 14, 15, 16, 17). The reason this is important is because arthritis pain doesn’t always respond to traditional dog pain relief meds, but CBD has a direct effect on arthritis pain by reducing inflammation and mediating pain with its own unique mechanism. Additionally, because statistically most dogs that suffer from severe arthritis are senior dogs, the use of traditional pain management medications may be contraindicated due to cardiac weakness. CBD does not have the same type of cardiac effect and is therefore much safer for at-risk populations. CBD can be used to mediate anxiety in dogs with severe anxiety issues, with some hints that it may even help with depression (18, 19, 20, 21, 22, 23, 24). Studies have shown how CBD for dogs provides relief from anxiety, and is particularly useful in pets that do not respond to or are unable to take the more traditional psychiatric medications due to side effects or existing health conditions. The calming effects of CBD are thought to be the result of the action of cannabidiol on serotonin receptors in the brain, and CBD’s ability to help the hippocampus regenerate neurons in canines. Arthritis aside, Cannabidiol may also be used for joint pain in dogs caused by sprains, strains, and tears, particularly in older canines. This has been confirmed in many studies with animals like rats and human trials, but little evidence is available with its use on dogs (25, 26, 27, 28, 29). Once again, the CBD here works to mediate pain without the dangerous side effects associated with narcotic medications. CBD may be used to treat dogs with irritable bowel syndrome (IBS) (30, 31, 32, 33). Because CBD has anti-inflammatory properties, it can be beneficial for reducing the inflammation associated with this condition. 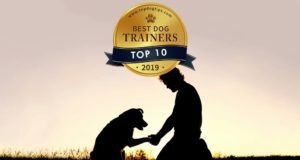 This not only reduces the pain your dog experiences, but it also reduces symptoms of IBS to cut back or potentially eliminate the disease altogether. Unsurprisingly, dogs with glaucoma have also been treated successfully with CBD according to vets and pet owners, as this is one of the most well-known health effects of the marijuana plant. There's some research on the positive effects of CBD on glaucoma (34, 35, 36). The ingestion of CBD sublingually has been shown to reduce the pressure in the eye of patients with glaucoma. Note that this reduction in pressure may or may not be permanent, but it does provide temporary relief. Studies show how CBD can slow down and even stop cancer growth altogether (37, 38, 39, 40). 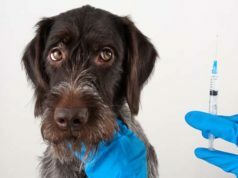 Veterinarians have been paying especially close attention to this possible health benefit and how to use CBD for dogs on the path of dying from cancer. Treatment of dogs with CBD doesn’t just kill off tumor tissue as mentioned above, but it can also stop and destroy cancer in its tracks. This is a result of CBD blocking cancer cells from producing energy, prohibiting cell growth, and helping the immune system to more effectively kill cancer cells. Dogs can also suffer from anorexia, and using CBD can help remedy this condition (41, 42, 43, 44). Whether caused by illness or treatment of illness (chemo in particular), anorexia in dogs is a real issue, and particularly so in older dogs. CBD can stimulate the appetite by increasing sensitivity to the smell and taste of food in dogs, making eating a more rewarding experience for your pooch. There are several heart health benefits that can be achieved from using products of CBD for dogs, but of most important note, CBD can improve cardiac function in dogs with arrhythmia (45, 46, 47, 48, 49). CBD has been proven to act as an anti-arrhythmic in animals when it is administered following the use of a CB1 receptor antagonist (AM-251). Reducing the incidence of arrhythmia then lowers the incidence of a cardiac event and improves blood flow to major organs in canines. CBD is also beneficial to dogs with serious bone breaks or severe osteoporosis (50, 51, 52, 53). Studies observed how the use of CBD stimulates new bone growth as well as serves to strengthen bones that have been damaged by osteoporosis. The added anti-inflammatory and pain killing properties of CBD are also of benefit here. The use of CBD oil has also been beneficial in reducing nausea in dogs (54, 55). Many chronic health conditions, as well as heavy-duty medications, come with nausea as a side effect. This is unpleasant, but it can also lead to more detrimental health problems like significant weight loss which is particularly dangerous in some populations of dogs. CBD use has shown to reduce or at least delay the feelings of nausea. CBD is a powerful neuro-protectant, meaning it serves to protect dog's nerve cells from different types of damage, degeneration and impairment of their function (56, 57, 58, 59). Whether administered following a neurological event or as ongoing treatment for patients with a high likelihood of a neurological event, CBD was shown to protect the brain from damage and reduce the likelihood of an event taking place. CBD can regulate blood sugar levels, help with apetite control and mitigate some of the symptoms of diabetes, according to research with animals and humans (60, 61, 62, 63, 64). When used correctly in diabetic dogs or dogs with trouble regulating their blood sugar levels, CBD was shown to have multiple benefits. With type 1 diabetes, CBD can regulate the immune system to reduce damage to the pancreas which results in worsening of diabetes symptoms. In type 2 diabetes, CBD can also improve sensitivity to insulin. Products of CBD for dogs can help with some of their auto-immune illnesses (65, 66). CBD oil was demonstrated to regulate the overactive immune system and reduce the damage it has on the natural functions and structures of the body. Different types of bacterial growth can be slowed down by CBD, and some studies found Cannabidiol to act as bactericidal substance, killing bacteria fully (67, 68, 69, 70). For dogs with chronic bacterial infections or stubborn bacterial infections that are unresponsive to traditional treatment, CBD can prove to be beneficial in slowing or even eliminating bacterial growth altogether. It's been shown how CBD for dogs application may speed up post-surgical healing and deal with surgery-associated pain or inflammation, as demonstrated in several animal studies (71, 72, 73, 74). The reduction in inflammation, pain control, and bone support CBD provides makes it ideal for speeding up the process of dog's healing after serious surgery. This method is particularly effective following orthopedic surgeries. CBD use may decrease the frequency and severity of muscle spasms (75). Muscle spasms in dogs can be the result of allergies, injury, neurological damage, physical injury, or a reaction to many different medications. Most of these localized spasms can be remedied with the use of CBD oil as demonstrated in studies. CBD improves sleep patterns in dogs with canine cognitive dysfunction (76, 77). Canine cognitive dysfunction (dementia) in dogs often results in confusion between day and night, interrupting sleep patterns among other things. CBD use has proven to have a positive impact on sleep patterns inducing drowsiness. Circulation improves with the use of CBD, according to research (78, 79, 80). There are numerous causes of poor circulation in dogs including heartworm and problems with the valves of the dog's heart. The application of CBD for dogs, however, has shown to improve circulation and reduce complications associated with poor blood flow. Although rare, dogs can suffer from the infamous skin condition psoriasis, and CBD can help treat this disease (81). Like other conditions that result from inflammation and immune response, psoriasis can be knocked out by the potent anti-inflammatory and immune-regulatory responses using products of CBD for dogs. As expected, CBD was shown to work very well as a muscle relaxant for pets (82, 83, 84, 85). In addition to treating muscle spasms as noted above, CBD also works effectively to treat conditions that cause muscles of the dog's body to tighten up. Such conditions include muscle hypertonicity, meningitis, myositis, and myasthenia gravis. CBD is a powerful antioxidant (86, 87). Like other antioxidants, CBD reduces cell damage in the dog's body that results from free radicals. This makes CBD for dogs a great source of relief, especially for those with severe allergies, skin conditions, and dogs with age-related deterioration. CBD is now also considered to be a powerful antiproliferative substance which comes with several health benefits of its own (88, 89, 90). In addition to preventing tumor growth and thwarting cancer, CBD oil for dogs can also play a role in preventing the migration of tumor cells and the adhesion of tumor cells to tissues and organs in the canine body. This makes CBD a powerful treatment in modulating the metastasis of cancerous cells. Previous articleCan Dogs Eat Asparagus?